North Americans take great pride in their lawns. We spend time watering, cutting, fertilizing, and anything else we need to keep our grass lush and green. A nice lawn is something we can be proud of. It’s a symbol of success. But have you ever wondered why grass is such a big part of our culture? Although lawns date all the way back to the European Aristocracy, their popularity in modern can be attributed to Abraham Levitt. In the 1940’s, he developed “Levittown”. This was considered the ideal American suburb, and where the image of a white picket fence became intertwined with the American dream. Beyond the fence sat a perfectly maintained, lush lawn. Levitt distributed pamphlets explaining how to care for your lawn, and the importance of doing so. His homes were so popular that they became trendy. They were the iPhone of the 1940’s – the thing that every family wanted. In those days, maintaining a lawn wasn’t as easy as it was today. Everything had to be done by hand. But as time went on, lawn maintenance got easier. In 1953, the gas powered lawn mower exploded in popularity. Weed eaters first hit the market in 1971. This year, the next generation of lawn care technology is available. Smart Irrigation Controllers are a step above the standard sprinkler system. Until today, these systems have operated on a timer. You might water your lawn every other day for an hour at a time. Not only is a scheduled system less efficient, but tends to waste quite a bit of water. 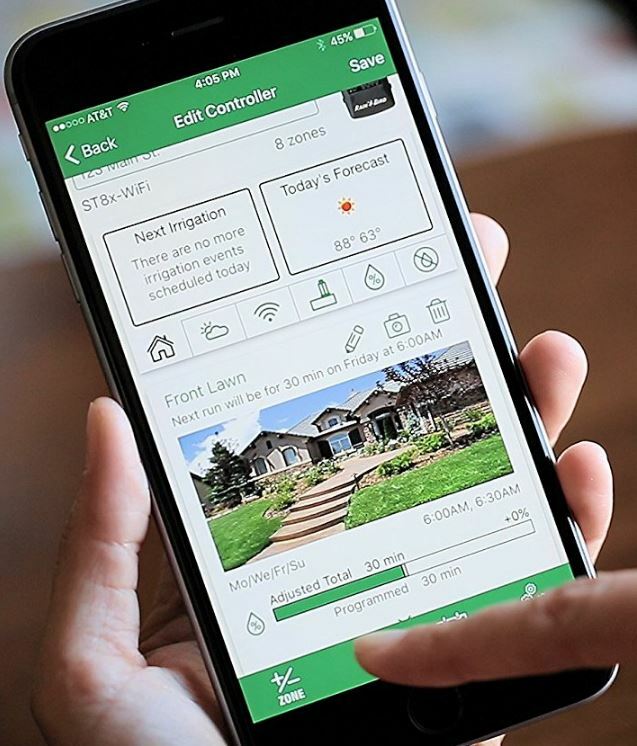 A smart controller isn’t just a schedule, but a sufficiently intelligent lawn watering system that can keep your grass lush and green for the entire season. No more wasting water, and no more dried out grass. In this article, we’ll be looking at the four best systems on the market. First, we’ll look at each model individually to find out what it can do. After, we’ll help you decide which one is right for your lawn. To show you the potential of a Smart Sprinkler system, we’ll be starting with one of the most advanced models available. 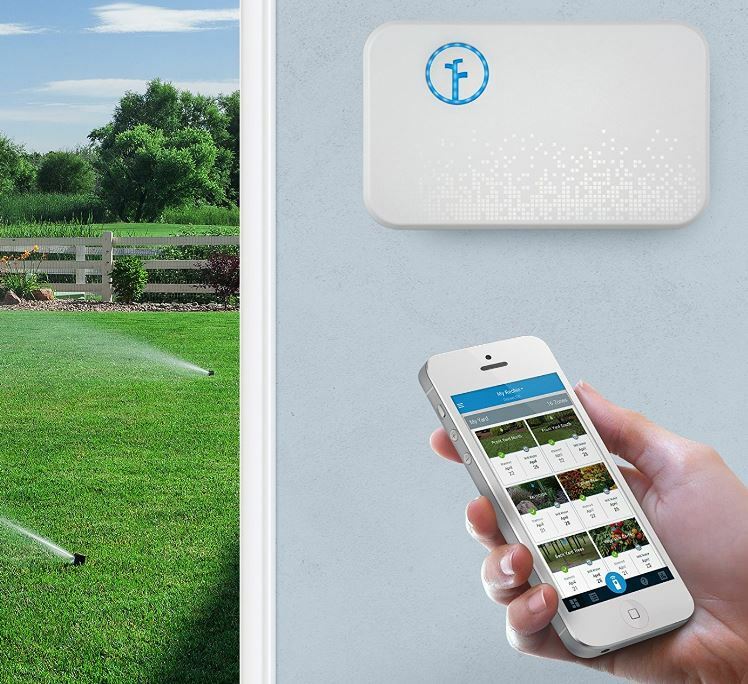 Rachio’s Smart Sprinkler needs only a WiFi network to operate and is controlled from your smartphone. It integrates with Amazon Alexa to provide voice controls, and can also be used with IFTTT. They offer an open API, so you can expect that there will be a lot more support in the future. 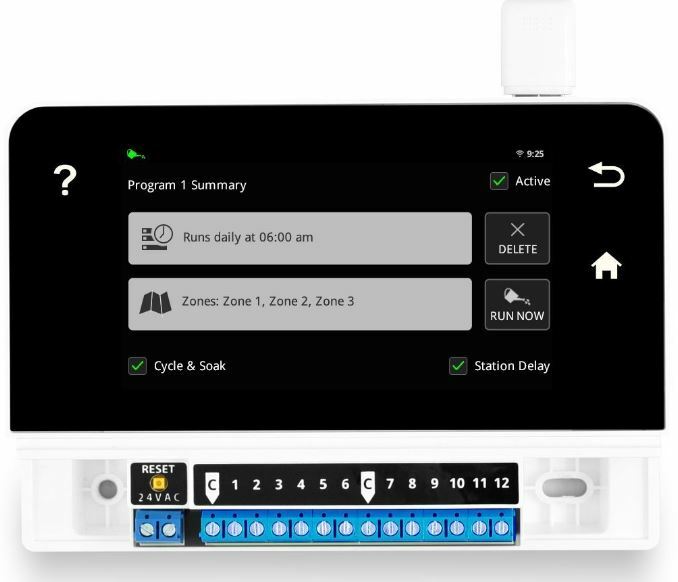 It supports 16 separate zones and can be used as a drop-in replacement for your existing controller. 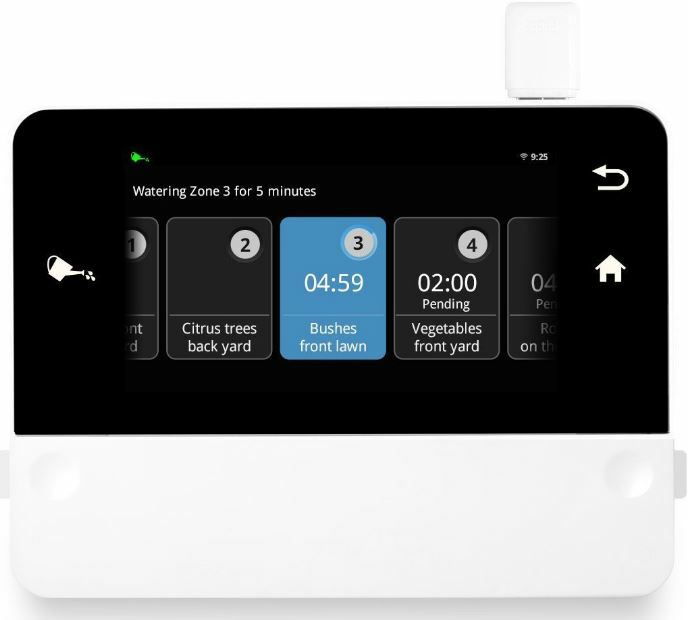 The Rachio Smart Sprinkler Controller is a large rectangular box, with a LED plant icon in the top corner. By holding the two clips on the side, you can remove the top cover. Once it’s off, you can install three screws through the designated holes to mount it on the wall. You then connect the wires, starting with the common and moving up the zones from bottom to top. If you have advanced systems, the top row of ports is used for sensors such as flow, or water pressure. But most consumers won’t have this in their home. The terminals don’t require a screwdriver. You just push them into place and they stay. There is a hole in the back which allows you to route the cables nicely, so the physical setup is quick and easy. Once it’s wired, the logo will illuminate indicating that it’s powered on. You then pull out your smartphone and load up the Rachio app. It will pair with the device, and help you register an account. It will then ask you a few questions about your system. How many zones do you have? What are the labels for each zone? Do you have a master valve? After these questions are answered, it will briefly turn your sprinklers on or off to confirm that they work. From this point, you’re ready to get into the more advanced features of the controller. 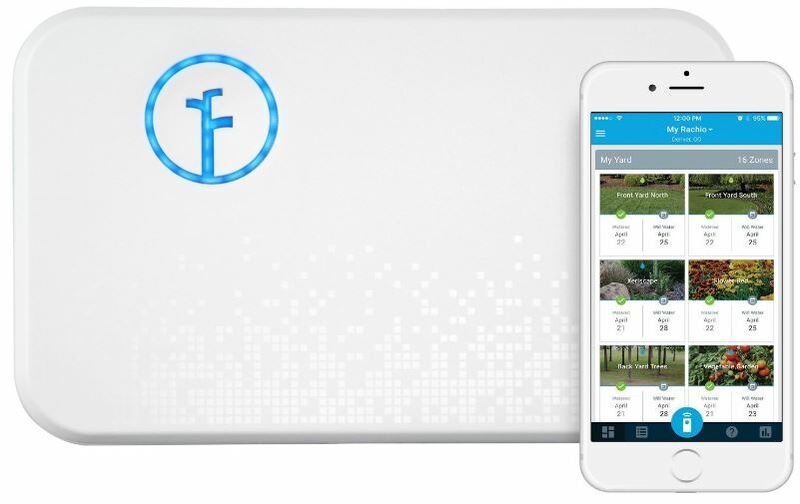 The Rachio Smart Sprinkler Controller is designed to be environmentally friendly, and save you money at the same time. It does so by reducing your water usage. This is accomplished by calculating exactly how much water your lawn needs. The app will ask you a series of questions about your lawn the first time you use it. You go through each zone one by one, and tell it what kind of grass or plants are growing there. You select the soil type and tell it how many hours of sunlight it gets. Additionally, you can also enter details about the kind of sprinkler head you have. Finally, you enter your GPS coordinates so the system can track weather. If this sounds like a lot of questions, it is. But all of these questions help the system identify exactly how much water your grass and garden needs. The sprinkler system will never over water, but it will still get the care it needs. When the weather changes, your watering schedule will adapt as well. You’re also able to set up a basic schedule. This doesn’t work as a standard controller but is designed to let you comply with local laws. If you’re on a water restriction, you can disable it. If you’re only allowed to water on certain days, you can enter this into the sprinkler system. You can also sync it up with IFTTT, and have it perform certain actions. You could set it up to turn on the sprinklers when you send a certain tweet, or you could get social media notifications under certain conditions. IFTTT is a little more complicated than some systems but offers a lot of flexibility for those who like to tinker. Although this model is a little older, it still has a very loyal following. RainMachine trades in cloud features for an entirely localized system. The only time it will need an internet connection is to access NAA.Gov, the national weather service. If you have a local weather station, you can do away with it all together. Everything is controlled from it’s built in display, from your phone, or from a local computer with network access. It can integrate with IFTTT. This does require a little more configuration, but gives you the ability to manually integrate it with other smart systems such as Alexa, Nest, Wink, and SmartThings. 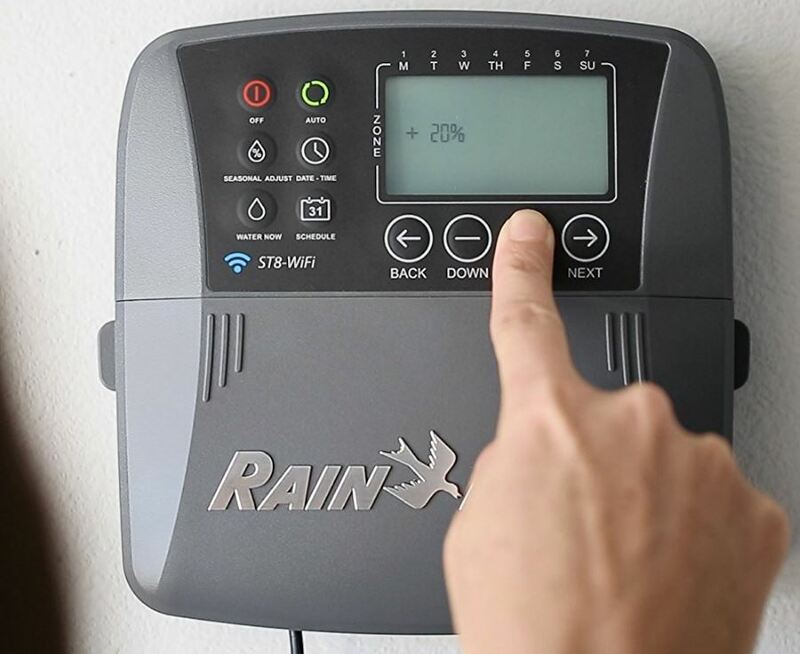 Since the RainMachine is EPA WaterSense certified, some states will be eligible for a rebate on the purchase of this controller. 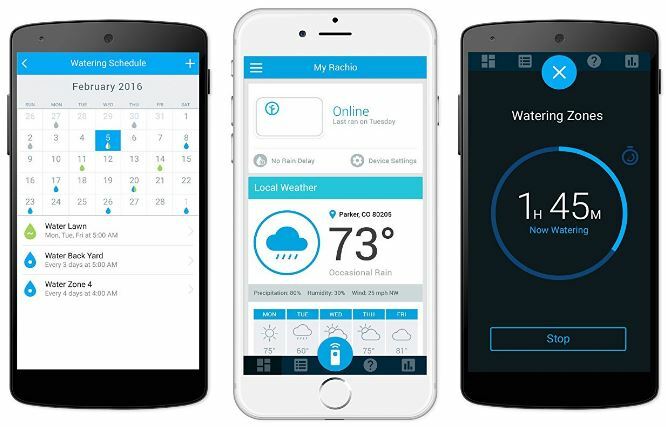 The process to install the RainMachine Touch HD is similar to that of the Rachio. You should leave the screen protector on while you’re handling it, and attach two screws to mount it. The bottom panel is removable and exposes the terminals. The standard wire goes on the left, followed by each zone. You need to use a flathead screwdriver to back off the terminals, then tighten them once the wire is inserted. Once the RainMachine is connected, you can replace the cover and power it on. You’ll set a password for the device, and connect to your WiFi network. You then need to set up each program manually. You choose the time for it to run, and specify which zones it applies too. For example, we set our program to water all zones every other day for 20 minutes. Three main watering features can be enabled. You’ve got Cycle & Soak, Weather Data, and Delay Between Zones. Cycle and Soak is designed to give the water a chance to seep in. Ours is set for 3 minutes. If you have a 20-minute watering schedule, your system would be on for three, then off for three. This would repeat for 40 minutes. You’ve still got 20 minutes of actual watering time, it’s just spread out over a longer period. Weather Data works by reducing your watering time based on the local weather. You should set your total watering time based on the maximum time you want to water on a hot day. If it rains a little, it might reduce this time by 25 percent. If it rains a lot, it will skip watering that day. Delay between zones, as the name implies, makes the system wait a bit when moving from one program to the next. If you have poor drainage, this will prevent you from overwatering your lawn all at once. The RainMachine is designed to function without the use of cloud services. However, it does sync up with IFTTT. This allows you to create certain schemes manually. For example, you could set up controls via text, social media, or Alexa. Just send the right command, and you’ll turn the rain machine on or off. You can also set it up to send you a DM on twitter about how much water you’ve saved each day. This feature is a little more rudimentary for most users, but if you like to tinker, it could be the most advanced system on the market. 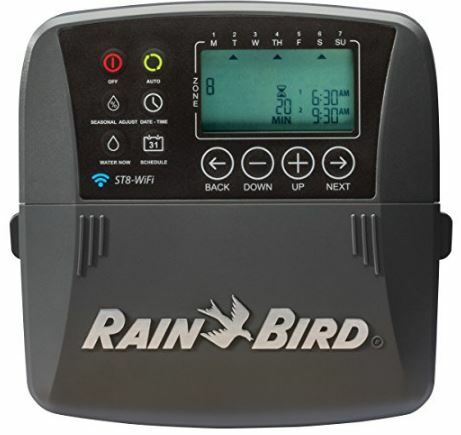 The Rain Bird is a simple, but affordable sprinkler controller. It’s a drop-in replacement for your existing system and provides the same rudimentary scheduling features as your current system. It has both WiFi and Bluetooth connected. When it’s configured on your local network, your smartphone adds a layer of intelligence to the system. You can manually adjust the schedule, or it can be done automatically based on your local weather. It supports 8 zones and works with both Android and iOS systems. Installing the Rain Bird ST8I is very similar to other models. It mounts on the wall, and you connect your power wire and up to 8 zones to the terminals on the bottom. The controller has a fold-open junction box, which makes it very easy to keep your cables neat. Once it’s all wired up, you install the two AA batteries supply power. You then pull out your phone and connect to the Rain Birds own WiFi direct network. Upon opening the free Rain Bird app, you’ll go through a simple setup procedure. You enter your WiFi details and label each of the zones. Once this is complete, you can disconnect from the RainBird’s WiFi network and continue to use your home network or the cellular connection. Your controller is now paired with your phone, so you can access it from anywhere. On a basic level, this operates just like a standard controller. 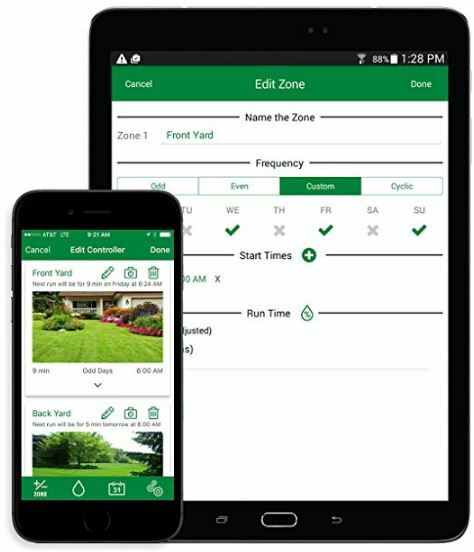 From your phone, it’s quick and easy to set the days you want to water, and you can have a different schedule for each zone. No matter where you are in the world, you can open up the app and manually start or stop your sprinklers. On this basic level, this is a sprinkler controller that you can access from anywhere in the world. The smart functionality all boils down to weather-based scheduling. In the app, you enter your area and load the local weather report. The controller will show you how the schedule will be adjusted to compensate for rainfall. This should be done about once per week, and can drastically reduce the amount of water used. 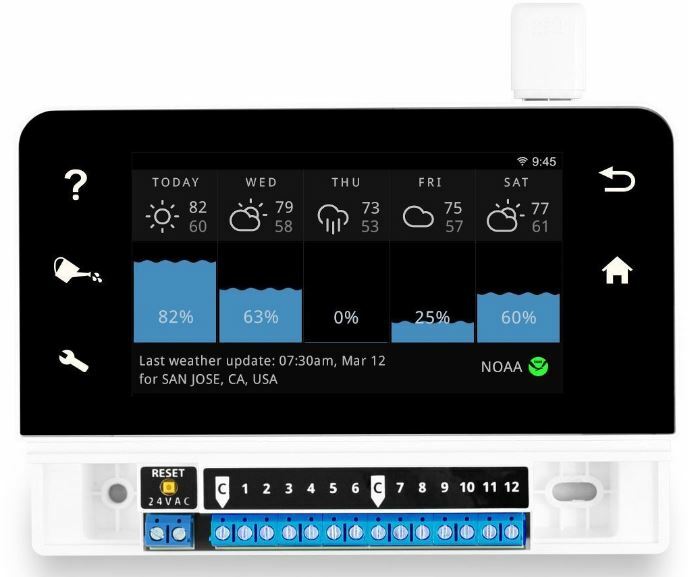 This controller is smart in the sense that it adapts your watering schedule to meet your weather. It syncs up to your smartphone, but cannot be controlled as part of a smart home system. 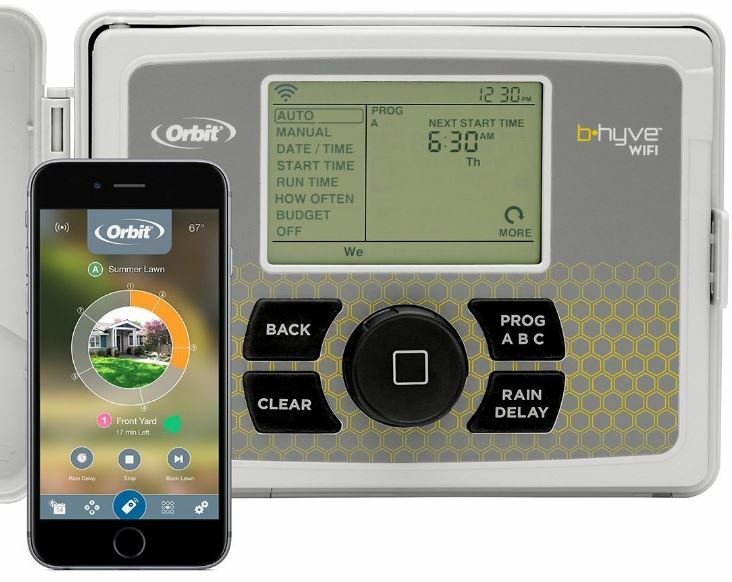 Despite being one of the cheapest controllers on the market, the Orbit B-Hyve Smart WiFi Sprinkler System offers functionality that’s typically only found in high-end systems. Orbit enables you to input a ton of data, and it will automatically determine the best watering schedule for your specific needs. It’s available in either 6 or 12 zone capacities and requires a WiFi network and a smartphone to function. Upon opening the box, you’ll find a square junction box with a small control panel in it. The control panel swings out, giving you access to the terminals. Wiring it is the same process as the others, using screw terminals. Once everything is wired up, you use the five buttons on the front along with the monochrome LCD display to power on and test each zone one by one. Once you know it’s wired correctly, you can launch the B-Hyve app to configure your schedule. During the app based setup, you’re asked a lot of questions. First, you provide your WiFi login details. Then you’re asked to provide information about the site conditions. What is the slope at each zone? What type of soil do you have? How much sun or shade does each zone get? You do this one a zone by zone basis, so large systems will be somewhat time-consuming. But once it’s complete, you’ll never have to enter this information again. When you’re setting a schedule, you don’t do it on a zone by zone basis. When you answered all the questions earlier, what you’ve done is help the system calculate the different water levels required for each zone. Let’s say, for example, that you set a schedule to water every day for 1 hour. The controller would know that zones at the bottom of a slope would need less water, while the upper ones would need more. From here, you can proceed with a standard schedule and let the B-Hyve work out the details. If you really want to unlock the potential of the B-Hyve, you need to enable the WaterSense features. 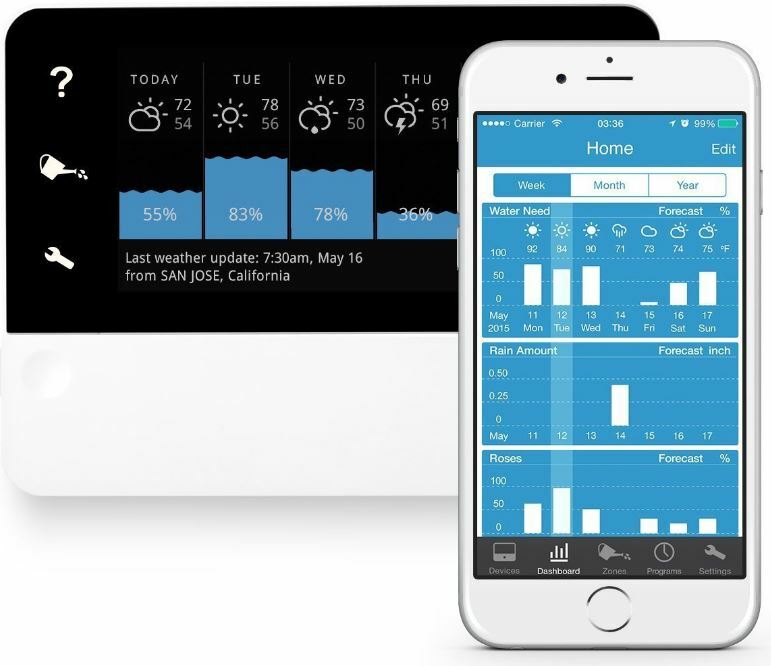 This system uses their proprietary algorithm to interpret how rainfall will affect your yard. It accesses the weather forecast for your region, and creates a week long schedule based on the weather data. This can be loaded automatically, letting the system run on autopilot. The B-Hyve syncs up with Amazon Alexa. If you’re planning on having guests, you can quickly ask the system to disable watering for the day. It will compensate for that day’s water loss by increasing watering times later in the day. Just say a command, and everything else is taken care of in the background. 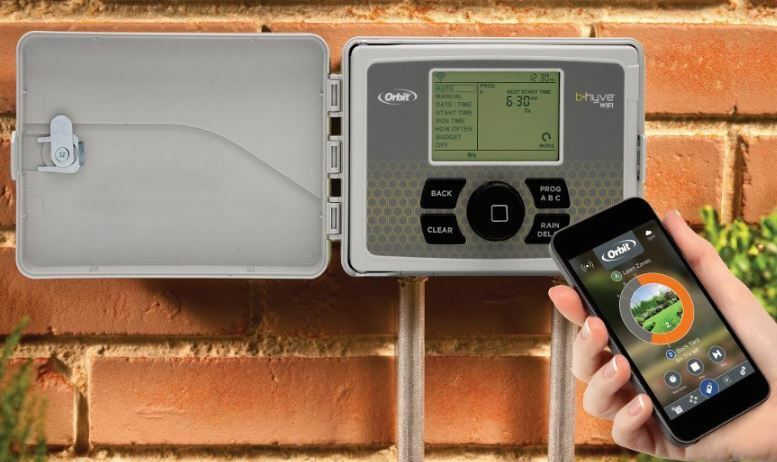 Which Smart Irrigation Controller is Right for Me? These controllers can be divided into four quadrants. To determine which one best suits your needs, you need to ask yourself two questions. How much do you know about your lawn? Do you have an existing smart home system you need to integrate with? If you’ve got an intelligent home system and you want to save as much water as possible, you should pick up the Rachio Smart Sprinkler Controller. This is one of the most advanced options on the market. Not only does it take environmental factors into concern, but it considers the types of plants you have as well. Your perennials won’t need the same schedule as your grass, and Rachio knows how to calculate it. This controller integrates directly with Alexa, and can be manually incorporated into other systems through IFTTT. It requires knowledge about the slope of your lawn, the type of plants you have, and what type of sprinkler heads you’re using. But if you can answer all of these questions, you’ll have the most conservative system on the market. On the other side of the spectrum, you’ve got the Rain Bird ST8I. This controller has a lot in common with your basic scheduled system. However, you’ll find it much easier to enter and adjust your schedule since everything is done from your smartphone. You can create individual weekly schedules that compensate for rainfall and sunlight, offering significant improvements over simple systems. Don’t need anything that fancy? If you’re only watering grass and have a relatively flat lawn, the RainMachine Touch HD is the best choice. It doesn’t compensate for slope, soil type, or plant type. What it does do is take your existing schedule, and perform daily adjustments based on the current weather. You can control it from your phone, or use the built-in touch screen to make changes. It can be manually integrated with existing smart home systems using IFTTT, so the techies out there will be able to create powerful configurations. The Orbit B-Hyve is a bit of a hidden gem in the irrigation controller marketplace. It’s the most affordable option on our list, but has the feature-set of a model with a much higher price tag. You can enter a ton of information about your lawn. The controller will automatically decide how much water each zone should get, and adjust the schedule to compensate for natural rainfall. It doesn’t provide the same level of control as other systems, but the system is so advanced that you don’t really need to. Just pick your watering schedule, and let the controller do the rest. 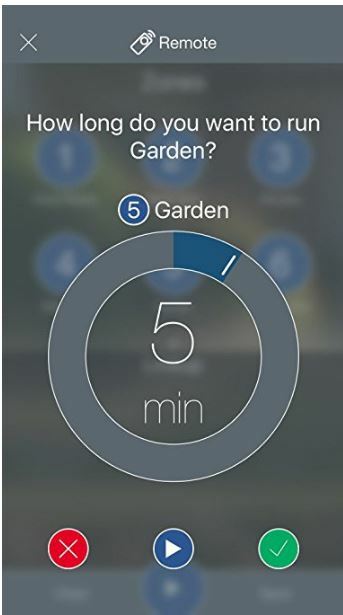 The second edition of the Rachio Smart Sprinkler Controller has made my life a whole lot easier. Out yard sees a lot of sunlight so watering it at the perfect time is ideal if we want to keep it green all year around. Thanks for recommending these, I agree – I think Rachio is the best. Do any (or all) of these devices enable me to limit the watering to specific day(s) of the week, in order to follow local HOA requirements? Blossom does, not sure of the the other ones. The Blossom App, let you turn off completely any day of the month with a single tap. I am looking for a web based wireless sprinkler controller that can function without connecting to the Internet. Are you aware of models that will operate without Internet access? Thanks for your reccomendations! Last week I came to your site and read about the Rachio and ordered it. I just installed it yesterday and the thing is amazing! Works exactly as I need and we LOVE the smartphone integration. I would caution against wiring 2valves on one zone. Most controllers cannot supply the increased current requirement of the two valve solenoids and you risk damaging the electronics. Check the installation instructions of your unit. Would be better to connect the piping of the two low flow zones rather than wire two valves on one zone. Thank you for the information? Are there any controllers that also interface with water PSI/GPM sensors?